This another simple test in continuation from last time. We will start with the same lineitem table as in the previous example. We will measure the time it takes to load the same 7.2GB text file repeatedly until the table size grows to about 1TB. We create a baseline with a table that has no indexes built on it. Then repeat with a B-tree index on the l_shipdate DATE column, and again after replacing the B-tree index with a BRIN index. Our baseline shows that as the table grows the time it takes to insert data also increases. The difference in the time that it takes to insert data when the table is near 1TB compared to when it is empty is about 12 seconds. With the B-tree index in place the difference increases to 84 seconds. Finally the change is only about 15 seconds with the BRIN index in place. 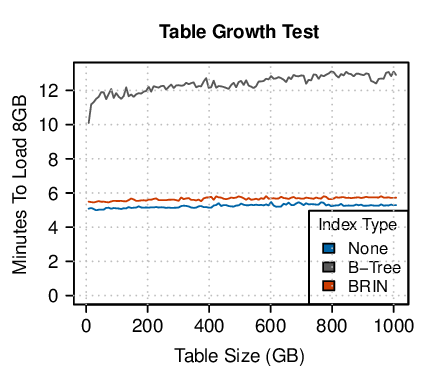 So over a 1TB growth, the overheard on inserting data into the lineitem table due to just the size of the table increases about 4.3%. B-trees increase that difference to 12.2%. While the BRIN index continues to look encouraging by only increasing the overhead to 4.2%.